What is the Dalai Lama’s favorite food? I had the supreme privilege of hearing the Dalai Lama speak today at the Seeds of Compassion gathering. I got up extra early (“farm early” as my friend Chad would say) to get a great seat at a dialog with His Holiness about philanthropy. I scored a seat in the third row and was thisclose to the great spiritual leader. 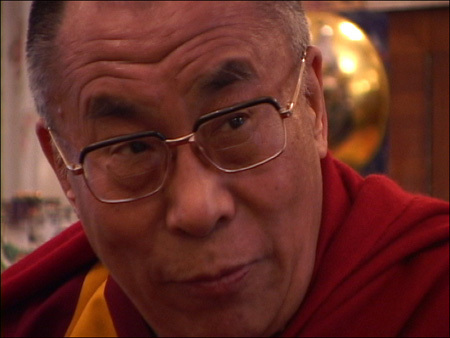 I have read several of the Dalai Lama’s writings and interviews with him, but I had never heard him speak. Just being in the same room with him was something special. He had wise words to share, but I was most delighted to find out that His Holiness has a great sense of humor. There was a panel of nonprofit leaders on stage with the Dalai Lama, and one of them asked him a very serious and involved question about examples of sustainable philanthropic programs that had garnered measurable outcomes. The Dalai Lama considered the question at length and then threw up his hands and said, “I don’t know.” He then went on of course to share his enlightened views about the subject. Before the dialog, I heard there was a special breakfast with His Holiness for sponsors and other VIPs. And it made me wonder: what was served? Did the Dalai Lama have pancakes, poached eggs, orange juice? Does he like butter on toast? I assume, like most Buddhist monks, he is vegetarian so bacon would probably not be on the menu. I know he drinks tea, but how about coffee? Did someone run to Starbucks to get him a vanilla latte? According to this silly YouTube video, the Dalai Lama enjoyed sampling soul food in Atlanta. I love the idea of this great spiritual leader chowing down on collard greens and cornbread. Today’s Seattle Times features an article about Justin A. Edgerton, a “music stylist” who makes music mixes for restaurants. Check it out.